This sharp 1962 Studebaker Gran Turismo Hawk was sold at a Barrett-Jackson auction. The 1963 model was similiar but like most second year models was not as quite as clean looking. The Gran Turismo Hawk was styled by Brooks Stevens who also created the innovative Studebaker Wagonaire sliding roof station wagon. The tail fins of the 1957 to 1961 Hawks were removed and a Thunderbird type roof was grafted on to the old "Loewy Coupe" body. Chrome trim was minimized and a handsome new dashboard highlighted a sporty interior with bucket seats and a center console. The result was a remakably good looking car that was developed on a miniscule budget. Studebaker's 289 cubic inch V8 was standard in 1962 and could be ordered with a four speed transmission, automatic, or overdrive. Hawk production increased dramatically from 3,929 in 1961 to 9,335 in 1962. 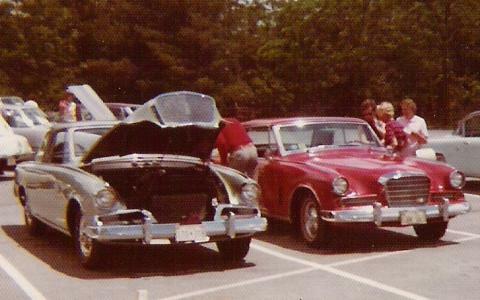 The 1962 GT Hawk on the left with its hood raised in the picture below belongs to Donnie and Linda Shanholtzer. The 1963 GT on the right shows the revised main grille, side grilles, and headlight rims used on the 1963 model. Perhaps the most important change for 1963 was the availability of Avanti R1 and R2 engines and the powershift automatic as optional equipment in the Hawk. Even so, Hawk production dropped to 4,634 in 1963. 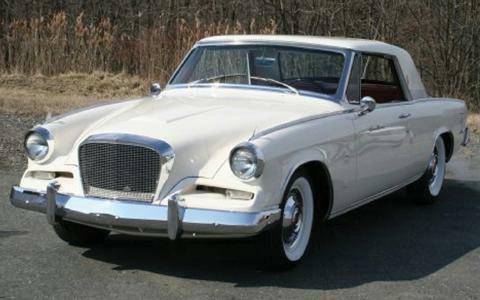 Brooks Stevens was also responsible for the styling of the 1964 Studebaker sedan line. This was a major change from the previous year with new front and rear fenders, new front panel and grille, new hood and trunk lid, new rear panel and tail lamps, and a new roofline on sedans and hardtops. The "Lark" name was dropped and the Commander name returned. 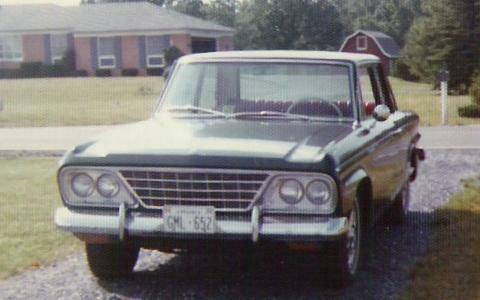 I bought this 1964 Studebaker Commander 2-Door Sedan in the mid-1970's from a James Madison University student. What makes this car unusual is that it is a "Commander Special" that was assembled in Canada after the close of the South Bend plant. The Commander Special featured a Daytona style interior and standard dual headlights. It was an excellent highway car with its 180 horsepower 259 cubic inch V8 and overdrive transmission. This basic design with a mild facelift for the 1966 model year carried Studebaker to the end of production in March of 1966. Studebaker built quite a reputation as a performance car in the 1920's and 1930's. 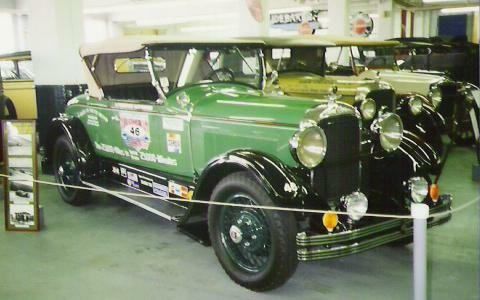 In August 1927, three stock Studebaker Commanders ran for 16 consecutive days until each had logged 25,000 miles. The fastest car averaged over 65 miles per hour and all three averaged over 60 miles per hour. This broke all existing endurance records for stock cars. Commanders of this period were powered by a 354 cubic inch displacement six cylinder engine. This picture was taken during my August 1994 visit to the Studebaker National Museum in South Bend.